At the conclusion of the war, Major D Douglas Ogilvie produced a book about the The Fife and Forfar Yeomanry from a mixture of the Official Diaries and a personal diary maintained by Lieutenant Colonel J. Younger, a former CO of the Battalion. The subsequent book published in London, 1921, The Fife and Forfar Yeomanry and 14th (F. & F. Yeo.) Battn. 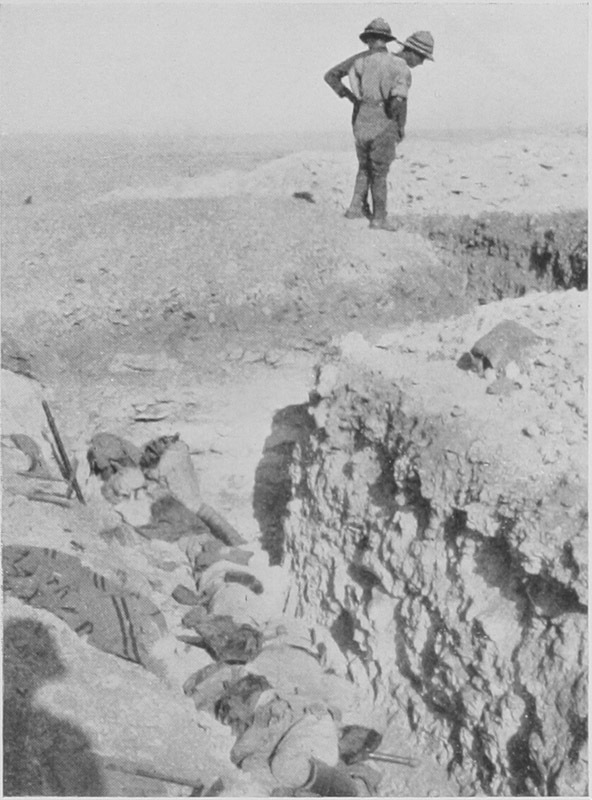 R.H. 1914-1919, included a section specifically related to the battle of Beersheba and is extracted below. At the moment of kicking off we were as well trained as we were ever likely to be, and, what is more important, were very fit and full of the offensive spirit. The concentration started on 25th October, when we marched some six miles to Abu Sitta. Our transport establishment had been very carefully thought out, and, though both animals and vehicles were undoubtedly overloaded at the start, this soon rectified itself, as consumable stores could not be replaced. We had one camel per battalion for officers' mess, and he started out very fully laden. He was a good deal less heavily loaded towards the end of the operations. Next day we marched on beyond the Wadi at Gamli—a very dusty and tiresome march—and were to have remained there throughout the next day. Word came in, however, that the Turk was attacking our outpost line at El Buggar, some ten miles out, and the Battalion had to move off  at a moment's notice about noon. The march through the heat of the afternoon was most trying, and on arrival it was found the enemy were occupying part of the line we were to take up. They withdrew, however, in the evening, and we constructed a series of strong posts from the Beersheba road to south of El Buggar. During these days of concentration the plain lying between Shellal and Beersheba had been the scene of great activities. Karm had been selected as the position for a forward supply dump, and both light and broad gauge railways were being pushed out towards it at top speed. The first blow of the campaign was to be launched at the defences of Beersheba, which were facing west and extended both north and south of the Wadi Saba. They occupied a commanding position and were continuously wired. The main attack was to be pushed home south of the Wadi Saba by the 74th and 60th Divisions, and at the same time the enemy's extreme left flank was to be turned by the cavalry, who were to make a wide detour through very difficult and waterless country and attack Beersheba from the east, and, if possible, cut off the retreat of the garrison of the Beersheba area. Covering all these preparations an outpost line was established some miles east of Karm and El Buggar, held on the left by the 53rd Division, then the 74th Division, then the Imperial Camel Corps, and, south of  the Wadi Saba, where it was much more lightly held, a mere line of cavalry observation posts. These cavalry posts were covering, and slightly in advance of, the positions selected for battle headquarters for the 74th and 60th Divisions. The preliminary arrangements for the troop movements went like clockwork, as did also the approach marches to the positions of deployment, and at the appointed time on 30th October, the Divisional H.Q. moved up the five or six miles to the battle stations selected. There was no sign of crowding or confusion—the only indication that there was anything unusual on, was the dust which could be seen here and there. The moves of the infantry began just as it was getting dusk, and long before dawn both the 60th and 74th Divisions had their two brigades on the line of deployment, which stretched southwards some three or four miles from the Wadi Saba. As soon as it was daylight a bombardment of the Turkish advanced position on Hill 1070 was started, smothering the entire landscape in clouds of dust. This first attack, which was carried through by one of the brigades of the 60th Division, was ordered at 8.30 A.M. Hill 1070 was carried at 8.45, and during the next hour all the remaining advanced positions fell, and it was even reported that the enemy was here and there evacuating portions of his main line. There was now another interval for  bombardment, whilst the gunners were wire-cutting for the attack on the main positions. During this period of waiting, which was longer than had been expected, our infantry suffered a good deal from shelling, much of which was in enfilade from positions north of the Wadi, and it was with relief that they received the order about 12.15 to proceed with the main attack. In about forty minutes all the trenches opposite the 60th Division were captured, and the 74th completed their task only about twenty minutes later, one brigade having had some difficulty owing to incomplete wire-cutting. The 60th had, by 2 P.M., advanced some way beyond the captured trenches towards Beersheba, and the 74th crossed the Wadi Saba and cleared the trenches northward to the barrier on the Fara-Beersheba road. Meantime the cavalry had found their detour even lengthier than had been expected, with the result that they were some hours later than they should have been, and were held up for most of the day by trenches at Tel-el-Saba, a mile or more east of Beersheba proper. These were, however, rushed towards evening, and Beersheba was occupied that night. Very few of the troops allotted for the defence of Beersheba escaped, the whole operation being completely successful. The Engineers at first reported that the water supply and wells were intact; but this proved to be far from the fact, and within forty-eight  hours the shortage of water was being severely felt. After this smashing success in the first stage of operations all our tails were well up, and everyone was keen to know what was to be the next move. The next day found the 60th concentrated at Beersheba; the 74th just north of the barrier on the Fara-Beersheba road, while an advance northward had been begun by the 53rd and, in the evening, by a party of the 74th. One brigade group for the former advanced in a northerly direction west of Ain Kohleh, and the remainder in a north-westerly direction on Kuweilfeh. The left advance was successful, and a line was established on the desired objective, a ridge running east and west some five or six miles north of Beersheba. The other advance was not so fortunate; something went wrong with the supplies both of water and ammunition, and strong opposition was encountered. Also, it was impossible country to campaign in; practically roadless, and very much broken up with wadis and rocky precipices, which made it most difficult to maintain communications, even though a mounted brigade was thrown in to help. The situation up here was much the same next day. No great progress had been made, nor were good communications established, but they had managed to get through both water and ammunition. Other divisions were, however,  kept on the move. The 74th were moved up to take over some line from the left of the 53rd, the 60th were concentrated some three miles N.W. of Beersheba, and one brigade of the 10th was moved to Irgeig. This was an anxious day, as the 53rd seemed to be quite held up at Kuweilfeh and not too well provided with supplies, and there was considerable doubt, in view of the general scarcity of water, whether it would be possible to carry on the campaign, which involved rolling up the Sheria and Kuwauka defences from the east. Our Intelligence Department had for the moment "lost" a Turkish division, which complicated the situation very much as, if it were suddenly to appear on the right flank of our attack on Sheria, a most serious situation would be created. However, on the afternoon of the 5th, word was received from the 53rd Division that they had captured prisoners from numerous different battalions, some of which were known to belong to the missing division. This settled the question, as it was quite clear that the 53rd were keeping them too busy at Kuweilfeh for them to be able to send any serious force to Sheria. The "lost" division it seems was one which had been sent to reinforce the forces defending Beersheba, but by the time it got to Sheria the Beersheba defences were taken, and it was obviously no use going there. It was accordingly then sent to Kuweilfeh  in anticipation of an attempt by us to turn their extreme left flank.